Brian and I have been trying to stick to a fairly low-carb/high-fat diet…. Saying “high-fat” sounds insane, doesn’t it? I’m reading the book The Big Fat Surprise: Why Butter, Meat and Cheese Belong in a Healthy Diet … (as soon as I finish I’ll post my review)… the gist of the book is that everything we’ve been told about fat is wrong…. Fat = Good. But I’ll talk about the book in another post. The Wheat Belly book is big on low carb… Atkins too… All encourage a Low-Carb/High-Fat diet. The Low Carb part hasn’t been too challenging…. and we’ve been adding in more avocado and coconut oil. We’re still losing weight and not feeling hungry. Yay! Most of the time we’re pretty happy with our new way of eating, but pizza…. it’s hard to replace pizza and stay low carb. 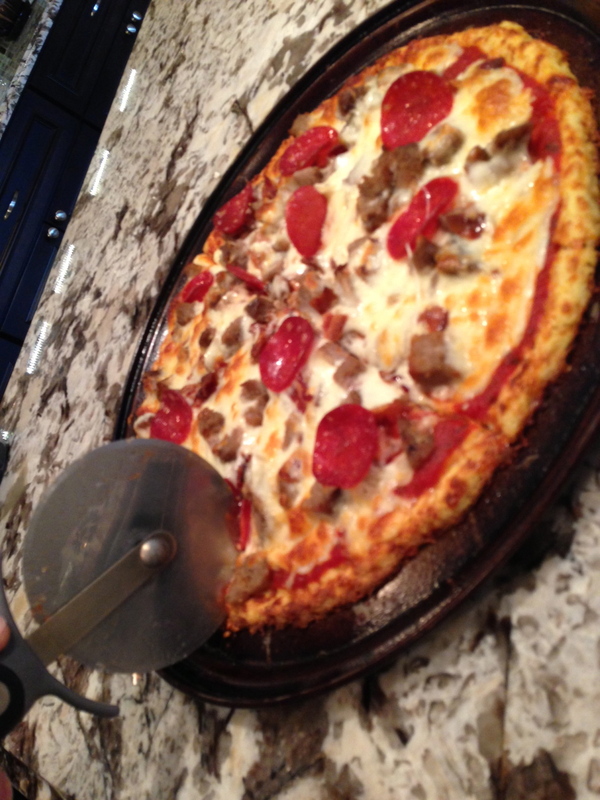 There are tons of gluten free pizza crusts on the market, but they are made with gluten-free flours and are high carb. Hunting around on Pinterest I came across a recipe for Cauliflower Pizza. I had pinned dozens of different cauliflower recipes…. breadsticks, mashed “potatoes”, “macaroni” & cheese, but I’d been hesitant to try messing with cauliflower…. it just seemed so fussy, but I’ll admit it… I was so, so WRONG. Place the riced cauliflower in a microwave safe bowl, add 1/4 cup water, and microwave for 6-8 minutes, stirring half-way through. Dump the cauliflower into a kitchen towel (I use a really thin one… I think it’s called a flour sack towel?) now twist the towel and squeeze the heck out of it. Get as much water out of the cauliflower as possible. Next, combine the cauliflower, mozzarella cheese and egg and mix well. Add the garlic and garlic salt. Transfer the dough to a greased pizza pan, and press into shape. Baked at 450 degrees for 15 minutes. The crust should be golden brown when done. Remove the crust from the oven, add your sauce and toppings. Place under a broiler at high heat until the cheese is melted and bubbly. 3-4 minutes. i should try this for a healthier pizza version! It really is delicious. Give me your thoughts when you make it!